The restaurant was celebrating its grand opening when a car crashed through the front window. 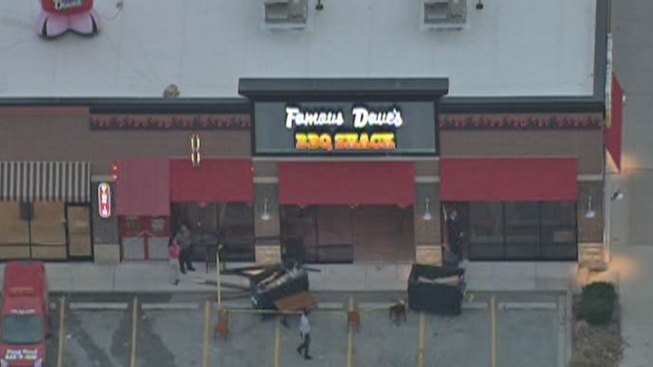 A car crashed into a just-opened Famous Dave's in south suburban Evergreen Park on Monday afternoon as the restaurant was celebrating its grand opening. The vehicle went through a front window of the eatery, at 2851 W. 95th St., at about 3 p.m. The car didn't hit any customers and there didn't appear to be any serious injuries, according to Eric Nissen, the chain's vice president of marketing. One woman in the restaurant appeared to be in shock after the crash, Nissen said. She was taken away in an ambulance. The 3,600 square-foot BBQ restaurant focuses on carry-out and delivery orders. Nissen said he and his employees were "very fortunate" and pointed out the restaurant was in the process of having a "record-breaking day" in sales. The restaurant is expected to be open for business again Tuesday, Nissen said.